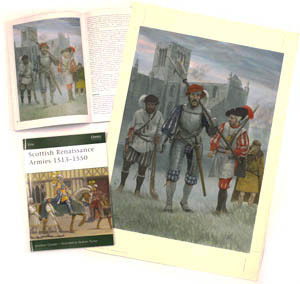 Graham Turner has been commissioned to produce paintings for many books, covering a wide selection of military subjects from Ancient Rome, through the middle ages and renaissance, the English Civil War, Napoleonic and Crimean Wars, to the First and Second World Wars. On publication of these books, the originals are returned to the artist and are then available for private sale. Copyright is retained by the publishers. These paintings are priced considerably lower than Graham would usually charge, to take into account the fee that the publisher has paid for their use - a great opportunity to own a unique original painting by Graham Turner for less. 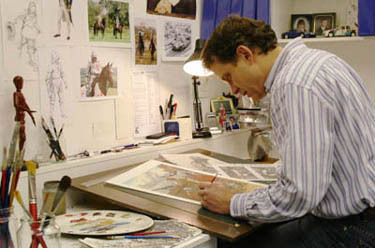 These paintings will be familiar to readers of the extensive range of titles published by Osprey, and to date, Graham has illustrated over fifty books for them. The originals are painted in gouache on watercolour board and are much larger than they appear in the books (image sizes are given with full details next to each painting). All the currently available paintings are shown on the Studio 88 website - CLICK HERE to view paintings. Although we endeavour to update this list whenever a painting has been sold, we cannot guarantee the availability of any painting as these are originals and consequently one-offs. Please feel free to email us to check on availability - info@studio88.co.uk. Graham Turner's original paintings are offered for sale by the artist himself, rather than through Studio 88, which is our print publishing business. Consequently, payment directly to him is prefered. Please contact Graham at info@studio88.co.uk to discuss how to proceed. PLEASE NOTE - Prices on the website are for UNFRAMED originals, and the prices reflect this. Some paintings are framed for display at exhibitions, and we can frame paintings and prints that are to be collected, but due to the glass these cannot be shipped. "Thank you so much! The painting arrived yesterday and is absolutely brilliant. I saw some of your work in some historical books in Waterstones that day so it was lovely to receive an original when I got home from work." "This is just to let you know that your beautiful book plate painting of the 14th Century Horses has arrived safely. This, together with our previous purchase of your 13th Century Horses, is being professionally framed and will be ready for our home later this month. 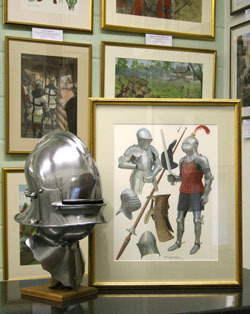 Our "Medieval room" is rapidly becoming our "Graham Turner room"!" "Thank you once again for the beautiful paintings." "Graham....I received the painting today....It is beautiful....thank you sooo much...it looks great with the other 3 paintings....."
"Graham's painting arrived today safe and sound. It's beautiful and Carolyn and I are absolutely thrilled. Thank you very much for all your help in getting it to us so quickly! Carolyn is already planning our next purchase(s) from you." "The picture arrived today, love it! I only wish I could buy lots more!" "The painting arrived safely today. I'm absolutely delighted with it." 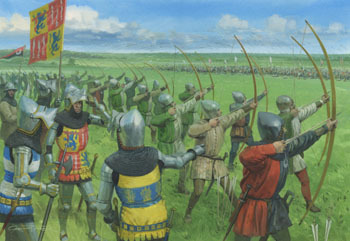 CLICK HERE to return to the Battle of Shrewsbury paintings page.